Time for FIFA to change? It is no easy job for Mr. Sepp Blatter to gain his position as the president of FIFA and build up his empire now. Then it will be equally difficult to change the world football organisation from what it ends up to now. Rather than just sit comfortably in the couch and watch football games at home, now the public can at least turn their attention to FIFA itself via knowing more about its ugly sides. Cash and knighthood for votes? Finally people’s speculations about this secret body echo in the media output and talkings of conspiracy now have their justifications. The Sword of Damocles is about to fall, and this is the time for FIFA to change. It is obviously “good” to know that FIFA has its own scandal, because if it is true (of course we do not know yet), the interest of the public was so hardly harmed in the bidding for the 2018 and 2022 World Cup. And maybe it has been harmed for a long time. If without media from England the “bad loser”, God knows at what point of history people will be informed of this possibility. James Olley from London Evening Standard certainly has his point saying that there will not be significant change with Blatter still in power. But he might be too optimistic here, as FIFA will not possibily to change even without Sepp Blatter. Just like a company, FIFA has its own culture and ways of dealing with things. Eliminating a CEO does not mean sweeping the whole set of corporation culture, which also seems impossible. If the scandals of bribery are true, then they must have become a vicious tumor in a dying body, and it was already too late for the public to find it out. Transplanting that specific organ will not cure, as the cancer has already spread to other parts of the body. The only way to turn this around is either to kill the body so that it will not hurt more or to let it be and wait for the miracle. Now the transplanting i.e. the FIFA election is just around the corner. Even if Mr. Mohamed Bin Hammam manages to make his way to the throne, dare he start it all over and end the corruption? Remember, FIFA is not just as easy as football, it is also about geo-politics. It is incredible to believe that someone that used to be part of the system will actually destroy all the dirty networks that it lives on, because the day of doom for that body will be the day of doom for himself as well. Do FIFA hate England? At least many of the English people believe so. All the ethics of being neutral, objective and open sound like intolerable offence to them now. This hatred, after what happens today, will unfortunately continue. Lord Triesman, former Football Association chairman and president of the English bid for the 2018 World Cup, claims that four FIFA members intends to take advantage from England’s campaign in exchange for their votes. These four members who are named include: Jack Warner, Nicolas Leoz, Ricardo Teixeira and Worawi Makudi. Some of them asked for cash or TV rights, one of them even request for a knighthood. This, of course, has once more put FIFA under fire. The world football organisation will apparently not want the public to be refreshed about its scandal exposed by the BBC and the Sun earlier this year. Their credibility has been severely lowered since then. Now about five month later the English people once again bring the issue to the light. Will Mr. Sepp Blatter, head of FIFA, be okay this time after he called England a “bad loser”? At least he seems so. So more investigations? To those cynics Mr. Blatter sounds once again like a politician. Need one more reason to hate England in this case? This just happened at a bad time. Soon in June Mr. Blatter will stand against Mr. Mohammed Bin Hammam, President of Asian Football Association, in the FIFA general election. What works better to bring down the 75 aged Swiss’ credibility than informing of FIFA members again the scandal? Well maybe football should thank what the English people have done in the sense of cleaning the environment. Only that England may need to pay for their chivalric move, again. “Johnny Depp is Rango.” The publicity line both on the poster and in the teaser is strong enough to draw some attention to Nickelodeon Movies’ new animated work. 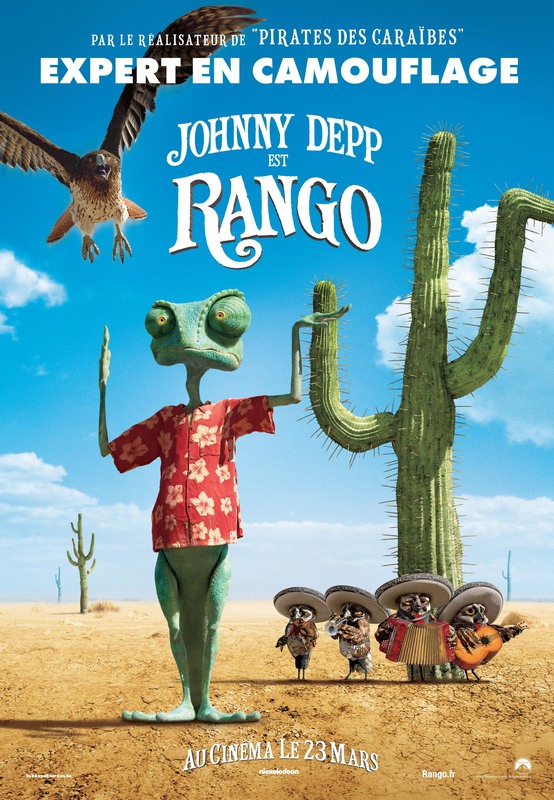 Rango (voice by Johnny Depp) is a chameleon that always wants to be a hero, but lives in a glass box as a pet. One day he is accidentally sent to a town called “Dirt” in the middle of the desert. There he finds love with Beans (voiced by Isla Fisher). He then starts an adventure to be a hero through a battle for water. It is actually not different from any American superhero movie. In the massive hopelessness, the public needs something to believe in; it is the result of hope that helps them live on. Johnny Depp still keeps his Captain Jack element, even through voice – a bit cynical, weird, unsettling. The backdrop of the Wild West also gives this movie some more nostalgic indulgence. Hans Zimmer has hidden his strong electronic style but presented a largely Latin American score, which fits perfectly with the smooth animation. It is quite hard to explain why a derby is so special for a football fan. There is some complex there to make it stand out from other games. London, capital of the country where the modern football originated, has its own interesting derby games. It will be a good idea to attend one of them as part of the course of stay in London. However the tickets can be expensive and hard to get. Sometimes you need to give up to your fate, as bad luck looms. But it will be a great shame if you miss it, still. So why not reach out to the stadium on a match day, stay there for a while, wait for the final whistle and feel the post-match atmosphere? I went to the game of Tottenham Hotspur v.s. West Ham at White Hart Lane with my colleagues on Saturday 19 March to get a touch of the London derby. Due to the complicated transport routes and the place that Hotspurs’ home stadium locates, we only managed to arrive the White Hart Lane during the half time. The score was 0-0. It was somehow weird to see such a scene. Massive rubbish was lying on nearly every square metre of the street and the pavement. It was like a demonstration of football fans’ beverage. Beer bottles, cola cans, newspapers, take-away boxes, you name it. Every sign is telling that there used to be a huge stream of people passing by, only that they were not there anymore. Even souvenir sellers were doing something else while keeping an eye on their goods, which were right now sun bathing in London’s early spring. When we got close to the south end, we could hardly hear any scream, any sighs of pity, any whistle blowing, which were supposed to belong to a football match. Not to mention this is the derby. “Is there really a match going on?” One of my colleagues asked. That was exactly what I was asking myself. It was a place like there was no such a game. But there is a game going on, only that we did not feel it and that the game in the massive cereal building is taking place too quietly. Thank God we finally heard the announcement from the stadium, of course in such a subtle way that the content could hardly be identified. As the match went close to the end – according to the clock not the sound – we started to get a sight on a lot of policemen. The shiny yellow shirt and the black too-stylish-to-fit-a-policeman hat of the London Metropolitan Police began to appear in a massive number. Police vans were lined up at the cross, blocking the street. Another team of policemen with anti-violent helmets was disposed in a line in the middle of the street, separating the street into two passages, half and half. Of course for such a massive event, human beings would also have to ask their animal friends for help. Horses with the police atop joined the group that separated the street. They stood by, and were obviously waiting for something or hopefully nothing from the match. Weren’t we waiting for the same thing? “There they come.” I could almost hear this from those police as well as from my colleagues, as those first group of fans came out of the stadium, not even before the match finished. Something strange caught our attention again. Those who got out first were all in a worried face and literally running. My colleagues would hate this, as they could not even get a proper interview. Those fans were running for the transportation. It would be a nightmare to get the car out of thousands of other cars and make it on the road after such a game. Not to mention the public transportation. Crowds could almost be impossible to avoid if not sacrificing the last minutes of the game. Then there went more of running fans, and more. Within five minutes fans filled the previously vacant street. Some of them were in quite good mood. We heard that the final score was still 0-0 – a good news for my colleagues and the police. Fans of both Tottenham and West Ham could accept this for a derby, which meant no extreme emotion were among the crowds. For most fans, 90 minutes without a single goal on a lovely, sunny Saturday afternoon could not let all of their energy out. Hence songs started to be heard from the crowd. It would be quite easy to get your song echoed when being around thousands of people who have the same favorite team. Fans of Tottenham, who were playing home, naturally outnumbered West Ham fans. Their supporting songs for the team and their hero Gareth Bale were of course of a higher volumn. You could also hear the minority sang back, waving their team colour, they did not cause of trouble for the police. My colleagues seemed getting lucky there, as they managed to stop some fans to talk to. Towards the media, fans were quite enthusiastic. Those who stopped by were very willing to share their opinions and to show off their love for the team. Everyone was walking in order in the two passages separated by the police. Everyone seemed to just want to go back home and enjoy the rest of the weekend. 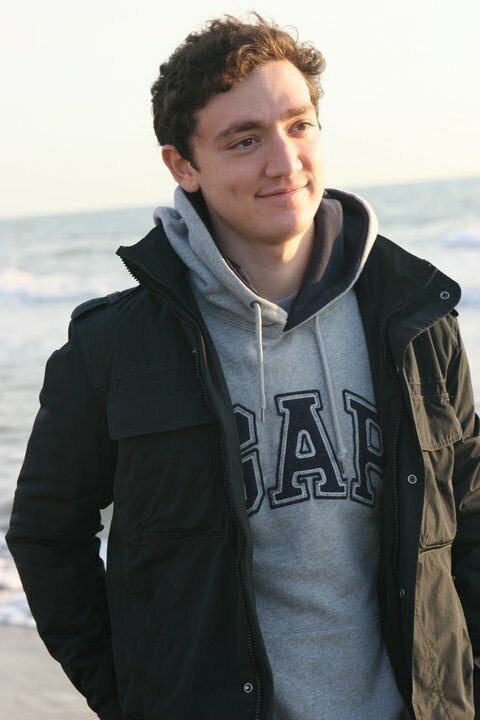 He won the Italian national championship as a swimmer when he was only 12 years old. But he did not like the sport. He found his love for tennis and reached the national level when he was a teenager. Italy may have its own Michael Phelps and Andy Murray now if he had ever continued either sport. Luca Pisculli, now a final year student of political science at Roma Tre University, has followed his own heart to finish the player career but still keeps his passion for tennis, the sport that has already become part of his life. Luca is quite nice and easy to approach, but his caution can still be detected when talking to a newly known person. “I don’t know it in English,” Luca the Italian said every time when he tried to clarify himself so as to avoid confusion. It sounds hardly too ambitious if a player says he wants to be the best in his field, but the then 18-aged Luca chose to be very down-to-earth about his career. He decided to finish his sportsman career and turned to coaching and study. “I was a good player, but I start to play late in the age of 12. In one year I was able to enter the national championship. For several years I was really good. At the age of 18 I need to decide if I want to be a professional player or I just want to study, ” he said. Even though it was a difficult decision for him, he seems to have less regret than satisfaction, and soon he found another way to keep tennis in his life. The now 23-year-old added with relief and slightly detectable sense of pity: “I’m happy with my decision. My other friends continued to play as professional players. They are still playing now but they are not good enough to make a living with tennis. Luca is now holding the certificate of international coach for tennis, after he went through a long journey. “In Italy if you want to be the coach for professional players, it’s very difficult. You need to do the six-month course, pass the exam and after that you need to work with a national coach for two years, pass another exam, then you can become a tennis coach,” he explained, paying absolute attention to clarifying each stage. Aged 23 in 2010, he was the then youngest person taking the final exam for the international coach certificate. As a coach, he teaches young professionals aged from 12 to 26, and he knows how to enjoy this new role on the court as a different experience from being a player. Luca is also very self-reflective concerning his role as a coach. He believes that a former player career is very important for a good coach, although not necessarily so. “As a player you can understand how players think. Because you did it and you will know. It’s easier. He also emphasized the necessity of study for a coach by saying “If you are a tennis coach it is very, very important to study. Because when you study, you have an open mind”. “But in tennis, no one studies. Just few coaches have the graduation. In Italy it’s just Coppo, ” he added. Giampaolo Coppo, the 56-year-old international tennis coach who enjoys his reputation in Italy, used to train Luca to be a player and now helps Luca to be a good coach. In Luca’s life, study seems to be important as well, if not more important than tennis. During the Christmas holiday, he did not even go back to Sicily, where most of his family now lives. He has also chosen for himself a master’s degree, a bit surprisingly in motorsports management rather than tennis, as his goal of further study. “I’m going to do a master that’s not linked with tennis, because it’s better to have more ways, more possibilities,” he said. This year’s Champions League has just had its last eight after 16 exciting or boring games. Barcelona and Real Madrid from Spain, Chelsea, Manchester United and Tottenham Hotspur from England, Inter Milan from Italy, Shalke 04 from Germany and Shakhtar from Ukraine are technically the this year’s best eight European clubs, who have the chance to finally march to Wembley for the trophy. Similar scenes are being played in each year’s knockout stage. There are one or two predictable games and some finals being played too early. Fans of the last eight will of course enjoy it but do not forget those neutral fans, whose population will unsurprisingly be bigger. The draw is on tomorrow (Fri 18 March). Before that let us put teams together by ourselves and make it interesing. Why not? A repeat of the Champions 2009 League final? Fergie shall never forget summer night in Rome. Although Barca is now probably the team everyone wants to avoid, for the English club a bit sense of revenge will give players the extra willingness of winning and therefore more juice for the match. Pep Guardiola has been making extreme success with Barca since he toke over the club in 2008. Six trophies in the 08/09 season has made him in the record book of world football. This season’s 5-0 win against Jose Mourinho’s Real Madrid in the Spanish La Liga also made the testimony of him being the world’s most successful and young football manager. His clash with Sir Alex Fergusen will therefore be a two-legged match between managers of two generations. This derby will again turn London into a city of blue and white. Fans of both club will not have to travel too much to support their teams. Carlo Ancelotti’s team lost their ground in the Premier League, currently ranking 4th on the table. Roman Abramovic’s long-waited dream of the Champions League trophy did not come true with Mourinho being the manager. Now with the Italian cup expert, the Russian will certainly hope his team to go further to save this season, after losing the hope for champion on the other three frontlines. Harry Redknapp’s Tottenham has been delivering absolutely phenomenal performances in the Champions League, with Gareth Bale becoming the superstar and predictably the hot topic in the summer transfer window. But how far can they go? The Champions League will never refuse some surprise from a dark horse. Even without the attribute of the clash between the most succesful club in the history of Champions league and the defending champion, this will still be two interesting matches – all because of Jose. “The special one” will become the focus immediately wherever he goes to. A game between his current and former clubs will always welcomed by journalists, as it is almost a guarantee of good quotes. Still remember last year’s Inter v.s. Chelsea game? Mourinho gave his exemployee almost no chance to qualify. Will this game be another proof of his professionalism and cruelty? Who will be the better “miner”? The two clubs both with a background of mining industry are two surprises of this year’s Champions League. Shakhtar topped its group with Arsenal following. In the first round of the knockout they smashed AS Roma with 6-2 on aggregate. Few people will say that this Ukrainian club can go this far. Surprisingly, Shalke 04 is the only team from Germany in the Champions League as their companion FC Bayern lost to Inter Milan. The German Bundesliga will become the third league in terms of places of the Champions league in two seasons’ time. The last German bleed is necessary to remain this position. It will also be interesting to see Ralf Rangnick, who has just replaced Felix Magath as the coach, to take the quarter-finalist go any further with probable different tactics. Of course, the forever Spanish No. 7 Raúl González is another focus. He is currently leading the all-time goals table of UEFA Cup and Champions League. For 69 times he netted the ball into the opponents goals, and there is no sign that the 33-year-old legend is slowering his pace, as he has already nailed three goals in the tournament – the same with his Dutch colleague Klaas-Jan Huntelaar. With Jose Mourinho‘s success with Inter Milan last season, criticisms on his “ugly” football start to come under the spotlight as well. To be “ugly” or not, this is a problem. But not anymore when last year Spain was crowned in South Africa. Plus they also won the Europe Cup two years earlier, “beautiful” football has reached its heyday with a combination of the way it is played and the result. Sharing the same football gene with Spain, Barcelona made its way to a top European club. However, interestingly, they did not even make it to the Champions League Final. They were blocked in the semi-final. By whom? Morinho’s “ugly” Inter. Is “beautiful” football actually making the game beautiful? Take Barcelona as an example. They just beat Arsenal in the Champions League knock-out round for last 16. In the second leg they dominated the game by possessing the ball for 76% of the time according to ESPN, leaving their opponent chasing shadows. An even more embarrassing fact is that Arsenal did not even make one shot – they made the score level for a time by pushing Segio Busquets to commit an own goal. For opponents of Barcelona, an open game is almost equivalent to a loss. As strong as a team like Real Madrid (in the sense of the squad) can lost the game to Barca by 0-5, you can really not hope too much but for losing by less goals by Barca. So the logic makes the opponent tend to stay in a defensive formation. Voila, it is like a training session of Barcelona again. For the sake of football, there is no doubt that Barcelona is on the right track. They have pushed the aesthetics of football to another crest, by involving lots of short and quick passes, and incredible speed and flexibility. Leo Messi is just a definition of the football that Barcelona is playing now. It is beautiful, by itself. So why is Barcelona actually ruining the game? Apart from the defensive position that their opponents will choose, another reason is that Barcelona have not find an equivalently strong opponent who also play “beautiful” football. Arsenal’s games are supposed to be quite enjoyable, as their manager Arsene Wenger has well kept the Latin heritage for the northern London club. But when they meet Barcelona, they are like pupils playing with professionals. No offence, but the match is still dominated by the Spain club. Had we have another Barcelona, it must be quite interesting when these two teams meet together. Then it will be the testimony of the true beautiful football. The match will be quite balanced between two teams having the same philosophy. That’s why we need coaches like Jose Morinho, whose philosophy is rather pragmatic and based on muscles and strict execution of tactics. Since we cannot see another Barcelona to occur in the near future, we need an “ugly” team who is equally strong as Barcelona (in the sense of both the squad and tactics!). Then it will be a clash of two completely different types of football philosophy. The game is not necessarily made more beautiful for neutral fans, at least it will be quite interesting to see how these two teams will define the direction of the world football. The 2010 World Cup semi-final between Spain and Germany, and the final between Spain and Holland almost made it. This process should probably take five to 10 years, when teams of both types divide champions. Therefore to make this happen, Jose still have a long way to go. In China, the Spring Festival bears special meaning for Chinese people. This is the time, once a year, when people need to get together with their families without any excuses. For people who can go back home, they will find any plausible way that can make them home, despite the situation in the pre-festival traveling, which needs a strong body and highly determined mind. For those who cannot, celebrations of any means should also take place. It usually include sitting together with whatever people you can find that bear the same cultural capital. The conception of gathering is important. Chinese students in another countries are the latter. Although for a trivially few of them going back to China is still feasible in spite of the high traveling expense. Most of them are thousands of miles away from their families in such a crucial point of the year. But the spirit of the Spring Festival shall never be lost. When people are put in a different cultural environment, culture shock is almost deemed to be shared. People in this sense will tend to look for signs that maintains their bonds with the homelands. The more people feel that shock, the more hard they struggle to find those familiar cultural signs. Globalisation has enabled/forced people to scatter in the world while following the same universal calendar. Therefore when a certain festival is around the corner, people in places other than their mother lands will suffer the pain even more. But the bonds, to bigger or lesser extents, can always be maintained. Certain cultural elements still help people to be together with their families – in a virtual way. A imagined community, according to Benedict Anderson, will be generated when people share the same identity. Media, can sometimes function as the channel that delivers elements of the same identity. The Spring Festival Gala (chunjie wanhui) which happens on the evening of 30th December of the nular calendar, helps to build the imagined community for Chinese people. Usually a Spring Festival Gala will include following elements that makes up the jigsaw of Chinese culture: a lot of red decorations, festive songs, well-known stars, talkshows with mainstream topics. The gala, which is although disliked by the younger generation, is still capable of connecting people’s minds via presenting elements that are shared by differents individuals with the same cultural identity. In coming the exciting (or not) page design test for all print students! Below are some tips I summed up according to our previous sessions with Malvin. However, this may also interest those who intend to design their own pages with InDesign. Save the work on the local computer, not even on the server! Back it up on your flash drive. Don’t put two fancy fonts together. Don’t make the column too wide – it will make reading slow. Break up long columns with quotes, pictures or something else. Different articles must be clearly identified – not necessarily with an actual line. Don’t put too many drop caps – it will make it like a magazine. About tint. > 50%, put on dark-coloured words; < 50%, put on light coloured words. Picture captions are usually SMALLER than the body font (£9), and in BOLD. Don’t put too many pictures with heads together on the same page. Newspaper body copy usually starts high then goes low, or stays level. Spaces are okay, but don’t put it in the middle. The colour RED tends to come to you; while the colour BLUE tends to leave you. Don’t put too many panels on the front page. Mix up pictures with different SIZEs. Try not to make pictures “sit” on the advertisement. Guide reader’s eyes from the main story, to the 2nd, then the 3rd. The main story is usually made prominent by including bigger box, big headline, bigger-sized pictures, etc. Mix different decks of headlines. 3 decks with 2 decks and 1 deck. If you have two pictures with heads on the same page, make sure they have similar height from the chin to the head top. Don’t leave gaps between paragraphs. Don’t leave a single word at the ending line of an introduction (aka a “widow” or “orphan”). The colour should be SUBTLE, otherwise it will be too distracting. Balance positions of pictures, don’t put all pictures on the same side. Avoid two points of picture frames (squares) point to each other. Mix WARM and COLD colours. Newspaper uses eye breaks every around 200mm, otherwise the words will seem too intense. Make visual impacts via creating CONTRADICTs. Don’t chop off the chin in a picture. Font size for broadsheets: 70; for tabloids: 140. Keep pictures away from advertisements. Mix up different picture sizes and shapes. Body: 3mm intended, except for the first paragraph. Don’t break words in the heading. London has been haunted by the same ghost for 24 years. The ghost brings about love, hatred, mystery, memory and murder, together with an extravaganza for eyes and ears. It is a ghost of opera. 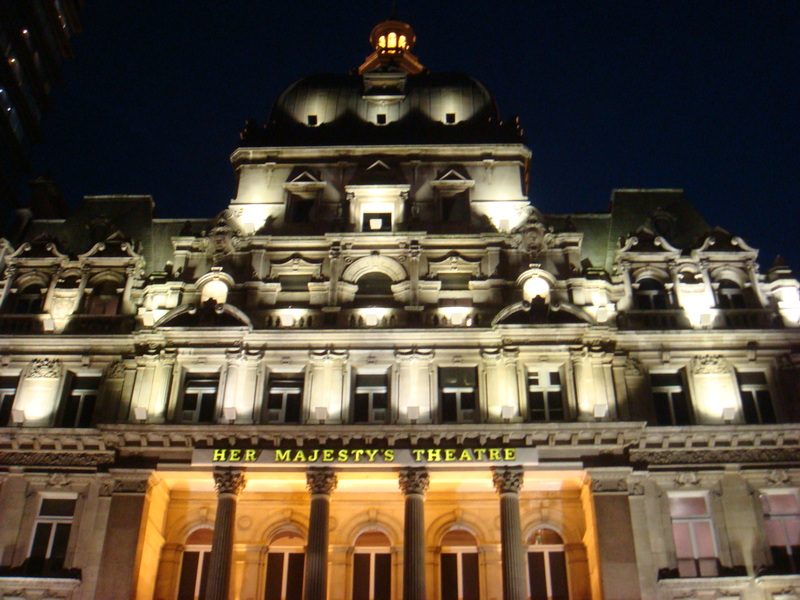 just celebrated its 10,000th performance at Her Majesty’s Theatre on 23 October. It puts a spell on spectators and drives them addicted, making itself easily stand out from other musical feasts in the West End. Based on the novel by Gaston Leroux, the musical tells a story of a “phantom” (John Owen-Jones), who lives secretly at the Paris Opera House and teaches the chorus girl Christine Daaé (Sofia Escobar) to sing. The “phantom” falls in love with his student and becomes jealous after discovering Christine’s secret engagement with Raoul (Will Barrat). The two love enemies go into a collision. The story itself contains almost every factor that a good love story should have, but its charm can be found beyond just story. Gillian Lynne’s staging design and choreography can easily re-define the senses of luxury and exquisite. Her talent is fully displayed in the second-to-none piece “Masquerade”, where a huge staircase winds from the floor to the air, creating a 3-D stage for massive characters to show off. A mysterious milieu is delicately woven with a glimmering surface. The music by Andrew Lloyd Webber is another brand of this glamorous musical. It very successfully combines emotions with the story. Single pieces from the musical have also become hits. Even days after the performance, you can still be obsessed with the melody of famous songs such as “Think of Me”, “The Phantom of the Opera”, “Music of the Night” and “All I Ask of You”. It can be easily put together with other works of Andrew Lloyd Webber. Although it is not as deep as Cats psychologically, not as related to the reality as Evita, it is still worth recommending to people who are passionate about love stories and good music. 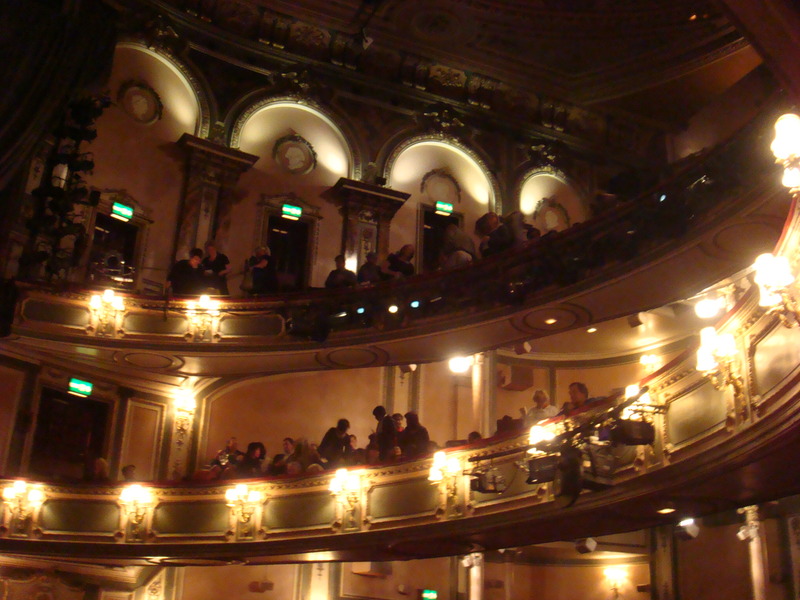 The London production of The Phantom of the Opera is now on show at Her Majesty’s Theatre, Haymarket, London, SW1Y 4QL. Tickets from £20. For more information, please visit the official website: http://www.thephantomoftheopera.com/london/.